Bradford is very pleased to announce another huge addition to the line-up. Conor Smith will be returning to the Rattlers roster for another season. Smith was Bradford’s leading goal, assist, and overall point getter in the 2011-12 campaign. 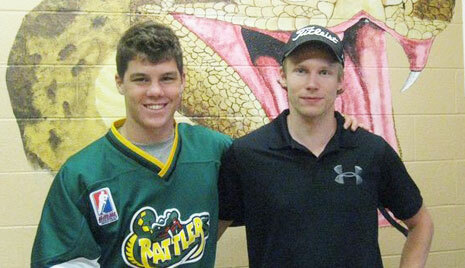 Smith led the Rattlers to a 3rd place finish last season scoring 34 goals, 36 assists for 70 points in just 41 games. Conor was born and played most of his minor hockey in Washington, USA at the AAA level. He spent the previous four seasons playing hockey in Beijing, China before coming to Canada last season. Conor is currently in Canada staying at the Rattlers training affiliate the World Hockey Centre. Smith also noted that he had received offers from the NCAA, EJHL and OJHL but felt the Rattlers were the best fit for this season. Stay posted to www.rattlershockey.ca over the next couple weeks. Bradford has 6 members of their alumni skating in ECHL camps this week and will be posting the results shortly.